Stacy Zarin Goldberg | Washington Post Honey-sesame squares: What is it about candy that has this nostalgic stranglehold on us? 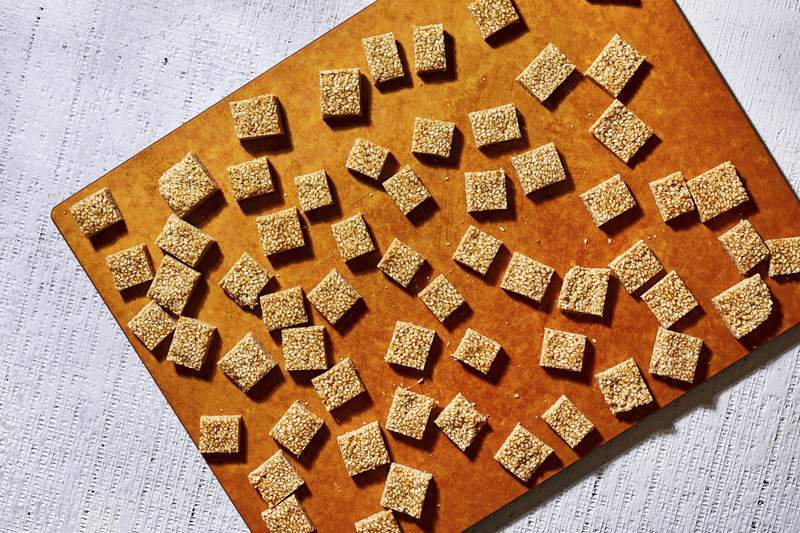 Photo for The Washington Post by Stacy Zarin Goldberg Honey-sesame candies: "I happen to like their resemblance to Scrabble tiles," says Becky Krystal. I don't eat a lot of packaged candy these days. If I want a sweet, I'm probably going to take aim at a baked good or ice cream. Some good dark chocolate or little artisan chocolate confection is about as close as I get – unless you put a bag of those mellowcreme pumpkins in front of me, and then I am totally, inexplicably helpless. But let's not go there. Yet something about candy has a nostalgic stranglehold on me – and on many of us. Maybe it has to do with those brain pleasure centers that light up and make us reach for Runts instead of rutabaga. Or maybe it's the good memories attached to candy. I still remember eating the Andes mints in the apartment office where I'd accompany my mom to pay our rent when I was a toddler. I have a less-distinct memory – my great aunt's candy dish, perhaps? – of those strawberry suckers that are hard on the outside but gooey on the inside. But sesame-honey candies – the individually wrapped, pinkie-sized bricks – will forever, fondly be associated with my grandfather. It has probably been decades since he pulled one out of his pocket for me and my brothers, yet still the association remains. 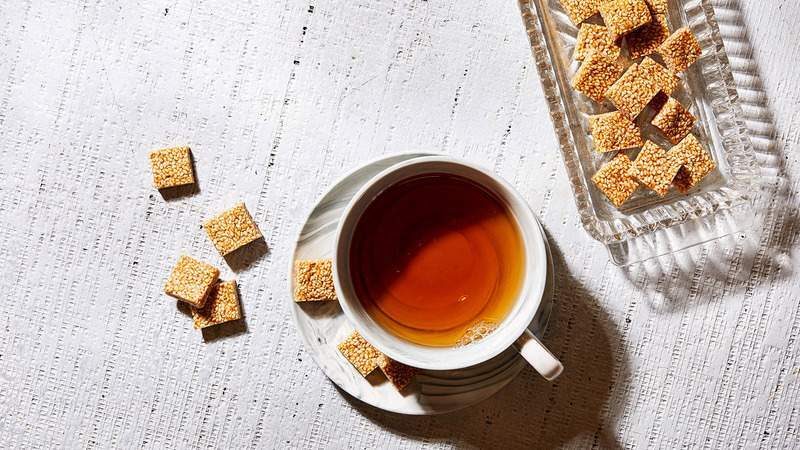 I flashed back immediately to that when I bit into one of these Sesame Candies from “Israeli Soul: Easy, Essential, Delicious,” the new cookbook by chef Michael Solomonov of Philadelphia's Zahav and his business partner, Steven Cook. The book calls it brittle, but we thought the texture was more chewy than crackly. I got a more toasty, caramel flavor when I used a darker honey and took the mixture to a slightly darker color. If you go the latter route, just be careful because it can burn quickly. If you want a thicker slab than the thin pieces this recipe creates, you can put the mixture in a pan with less surface area, such as a loaf pan. You'll probably end up with fewer pieces. As it stands, the recipe makes 64 small squares. (I happen to like their resemblance to Scrabble tiles.) So there's plenty for you to gobble down and still have enough to share. I think it's time I repay the favor and share some with my grandpa. Coat an 8-inch-square baking dish or pan lightly with the oil. Combine the sesame seeds, honey, sugar and salt in a small, deep saucepan. Bring to a boil over medium-high heat and cook for 2 minutes, stirring vigorously. Let cool slightly, then use a rounded table knife or thin plastic spatula to loosen the slab around the edges. Slide it onto a cutting board, then cut into 1-inch pieces. Serve right away (they will be a bit chewy), or let them sit at room temperature until hardened, about 1 hour. Makes 64 pieces from one 8-inch slab. The candies can be stored in an airtight container at room temperature for up to 2 weeks.